The fifty pence (50p) (Irish: caoga pingin) coin was a subdivision of the Irish pound. It was introduced in Ireland on 17 February 1970 – a year before Decimal Day. It replaced the ten shilling note when decimalised, albeit it could be argued that it also replaced the by then ‘elusive’ ten shilling coin (minted in 1966 to celebrate the 50th anniversary of the 1916 Rising) but that coin stopped circulating in 1967 due to a rapid rise in the value of silver bullion that was sustained until the mid-1970’s. It is a seven sided coin, an equilateral curve heptagon of constant breadth (30 mm). The sides are not straight but are curved so that the centre of curvature is the opposite apex of the coin – this is an equilateral curve which allows the coin to roll freely in slot machines. It was of the same shape and size of the British coin of the same denomination, as both nations’ pounds were pegged until 1979. 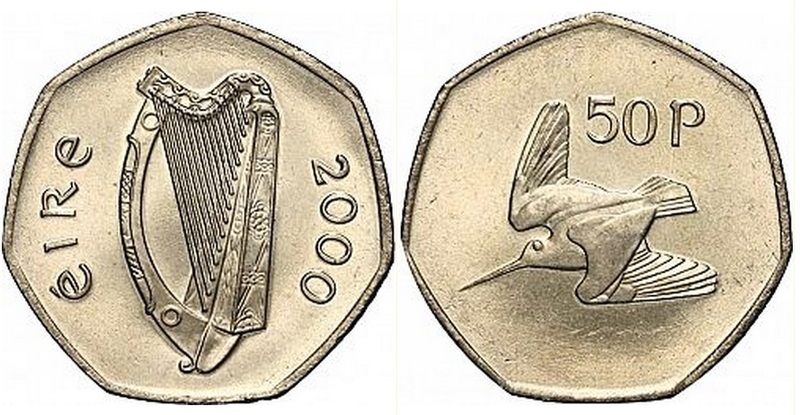 When, In 1997, the British 50p coin was reduced in size and the older coins were removed from circulation, the Irish 50p coins remained the same size and weight as before. The coin used the woodcock design from the pre-decimal farthing coin, designed by Percy Metcalfe and first introduced by the Irish Free State in 1928. In 1986, no fifty pence coins were circulated for that year – the 6,750 that were minted were used as part of a Brilliant Uncirculated (BU) set of coins that was mostly bought up by overseas collectors. As such, the 1986 fifty pence coin sells at a significant premium whenever it is offered for sale. Many of these sets were broken up due to the poor construction of the packaging, i.e. the glue seeps out and damages the folder. In 1988, two fifty pence coins were released by the Irish Mint – one normal and one commemorating the millennium of the City of Dublin. Contrary to popular opinion, neither coin is scarce – with 7 million and 5 million of each being minted, respectively. There was also a special Proof issue for the millennium coin, with a limited mintage of 50,000 being released to collectors and investors. 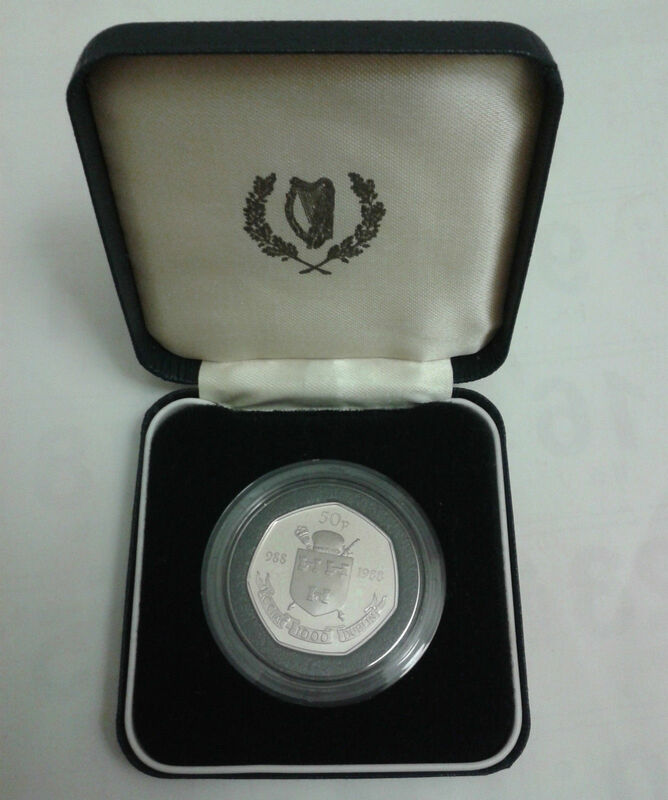 These should have a certificate included – if not, they might be uncirculated specimens inserted into a plain case. Caveat emptor – buyer beware ! The millennium coin was the first Irish decimal coin to feature words on it, i.e. the word “Dublin” in Roman script and “Áth Cliath” in Gaelic script, its equivalent in the Irish language. 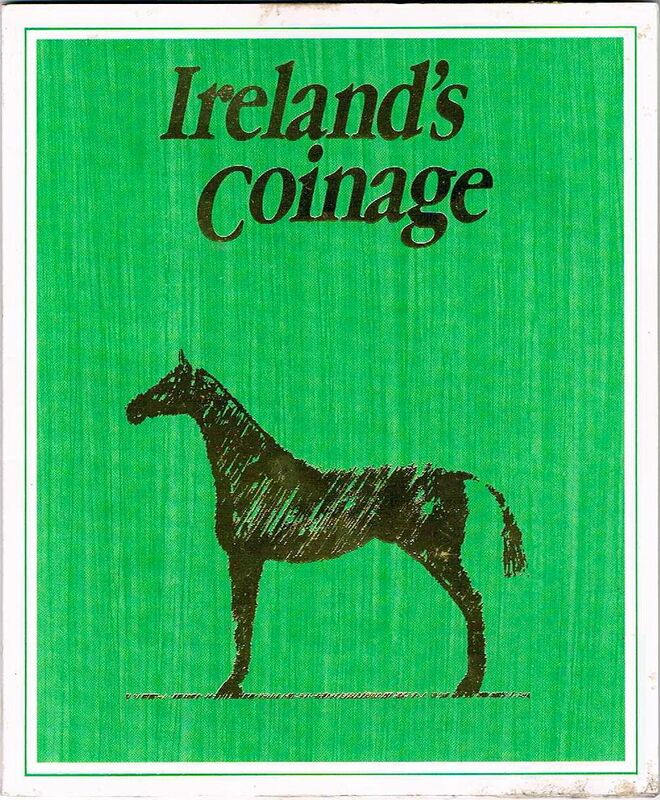 The coin was designed by Tom Ryan who would later design the Irish pound coin. Production of fifty pence coins ceased between 1988 and 1996 due to a combination of previous over-supply + reduced demand following the introduction of the twenty pence coin in 1986.